"How do you identify a spook?" "Who died on the Titanic?" "How do you capture a very dangerous animal?" "You are the calm before and during the storm." "They all belong to the same sick cult/club." "Find the spider(s) and build the web (the 'map')." "YOU EVIL SICK BASTARDS ARE STUPID!!!" "Could you sleep if you knew the truth about EVERYTHING?" "THE PUPPET MASTERS HAVE BEEN REMOVED." "We are FIGHTING for LIFE." "SHOW the WORLD the TRUTH." This is just the beginning." "[The 16 Year Plan To Destroy America]"
"Coming soon to a theater near you." 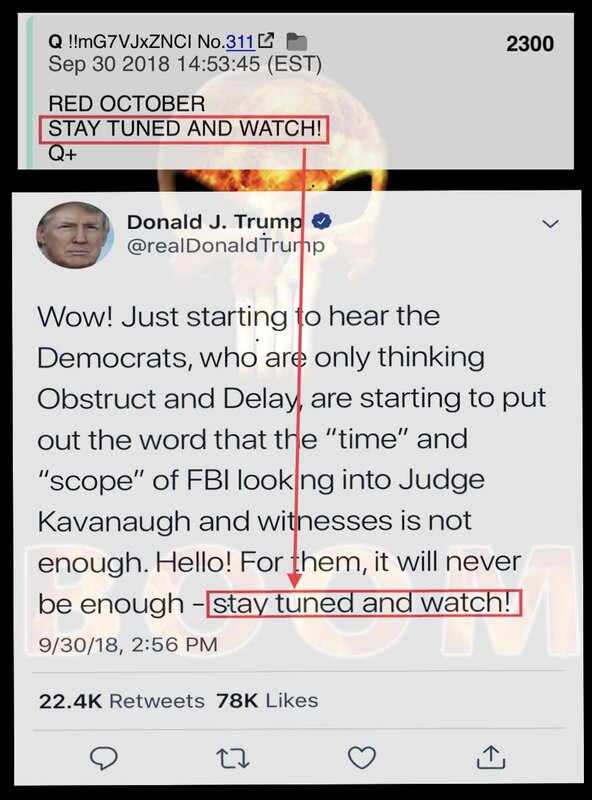 @POTUS Consider 2 possible alternative interpretations of "Stay tuned" & "watch"
Stay Tuned to the high frequency of Love, Truth, & positivity. Don't let events steal your peace or joy. Watch Red October & know #theGreatAwakening IS Happening. But be vigilant & stay alert.